Let me just say this… YUM! Oh my gosh, was this dessert GOOD!! From the cookie crust filled with bittersweet chocolate mint mousse and the chocolate martini to wash it down, it was fan-frickin-tabulous! I totally loved everything about this dessert. For me personally, the best thing about this dessert was that I could share it with my Mom. I consider myself to be very fortunate to be able to visit with my mom at least two to three times a year. You see, she lives in Hawaii and I live in West Virginia. It’s quite a long trip to make, so we’ve gotta make it worth it. My mom decided on a Thursday that she was going to leave on Saturday for a week-long visit. She arrived in time to visit the DC cherry blossoms before the rain and Mother Nature blew all the blooms away. We went to see a movie, went out to a few dinners, visited my husband’s parents, went to IKEA, and drove about 600 miles in 5 days! On Wednesday of her visit, I told her I needed to bake. She said that was a great idea and then promptly left for the outlet mall while I baked my cookies and prepared the crust. On Thursday afternoon, everything was ready to enjoy so we got to indulge on this magnificent dessert at two in the afternoon. When we went to dinner, we decided to skip dessert in favor of coming home for MORE of this tart! 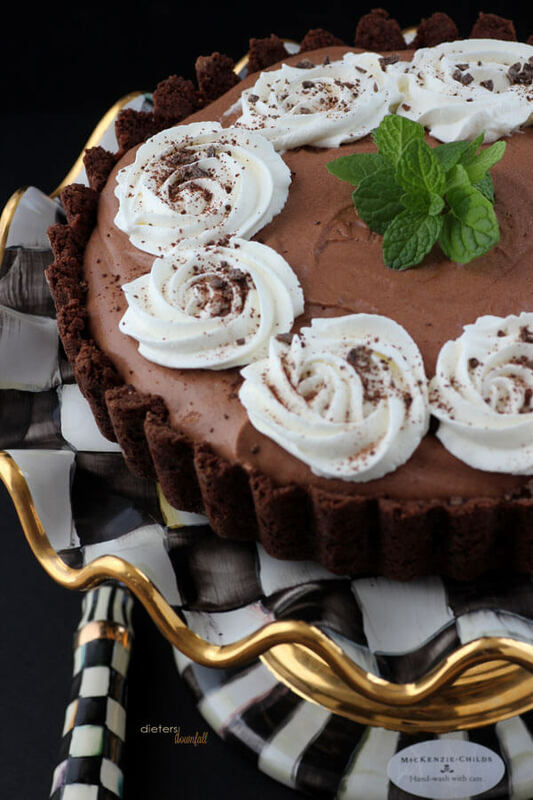 You can enjoy the mousse in the tart like I made or just served in individual bowls with a cookie. If you also want to have this in the middle of the day, go ahead! I certainly won’t judge. You can also eat it alone, but I suggest sharing it with a few people you care about – i.e., your book club gals, your neighbors, your BFF, and even your mom. I think your mom would really like this. Mine did! 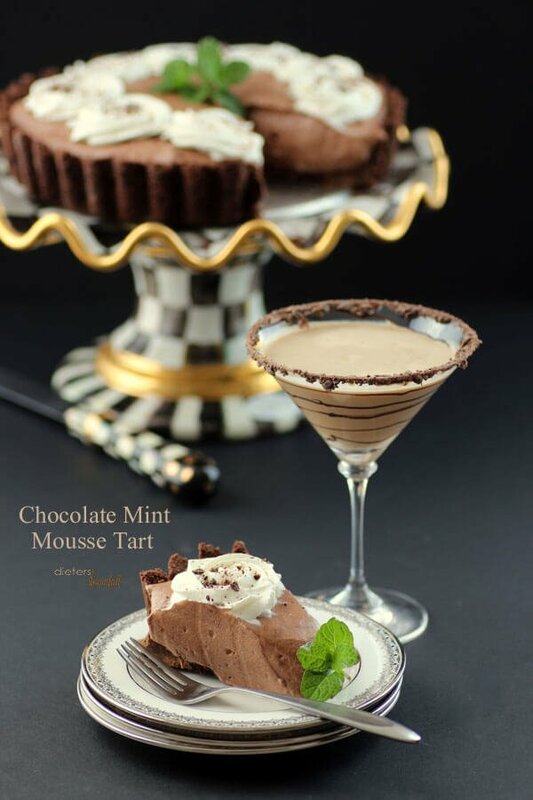 Bittersweet Chocolate Mint Mousse in a Chocolate Mint Cookie Crust served with a Chocolate Martini. It's pure Heaven! * NOTE -I did NOT add any of the white chocolate drizzle to the cookies used in making the crust. They were set aside to "dry" and crisp up for the crust. Place the cookies into a food processor and process until finely crumbled. With the food processor running, slowly pour in the melted butter. Press the wet cookie crumbs into a 9 inch tart pan. Bake at 325 for 15 minutes. Place a large glass bowl over a saucepan of simmering water. Coarsely chop the chocolate,cut the butter in ¼ tablespoon pieces and add them to the bowl. Stir until melted and smooth. Remove the bowl from the heat and whisk in the milk. Let stand for about 15 minutes, stirring occasionally, or until the mixture is cool. Beat the egg yolks and ¼ cup powdered sugar on medium-high speed with a paddle attachment, until light and airy. Gradually fold the egg yolk mixture into the cooled chocolate mixture. Wash and dry your mixing bowl. In your clean mixing bowl, whip the egg whites with the remaining ¼ cup powdered sugar on medium-high speed until soft peaks form. Gently fold in ⅓ of the egg whites into the chocolate mixture. Continue folding in the egg whites until there is no white remaining. Add the cream and the mint extract to the bowl that held the egg whites. Beat with the mixer (no need to clean the beaters) on high speed until thick, soft peaks form. Fold the whipped cream into the chocolate mixture until completely incorporated. Pour the mousse into the cooled tart pan. Cover it with plastic wrap to prevent a skin from forming. Place it in the fridge for at least two hours. Before serving, add some whipped cream to garnish along with some crushed chocolate or cookie crumbs. 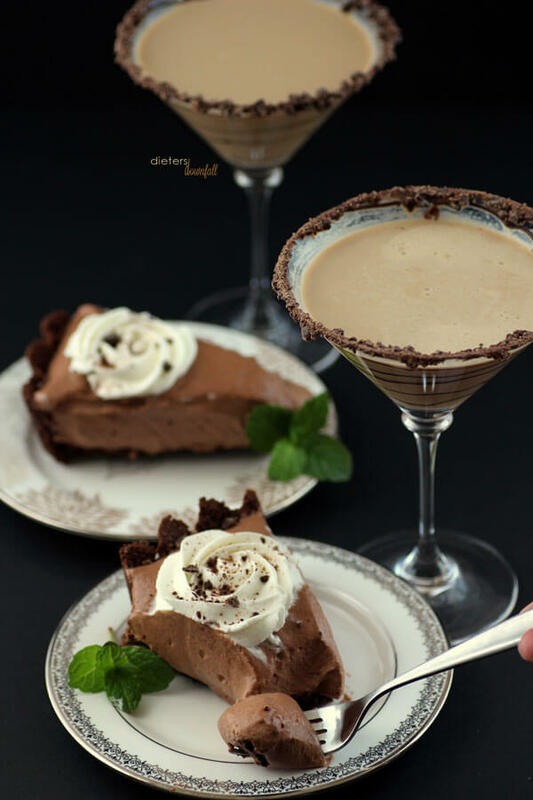 Serve with a Chocolate Martini and enjoy! 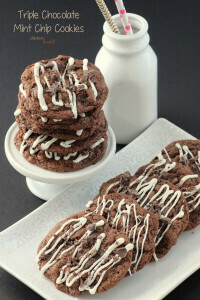 Find the recipe for the Mint Chocolate Cookies HERE. 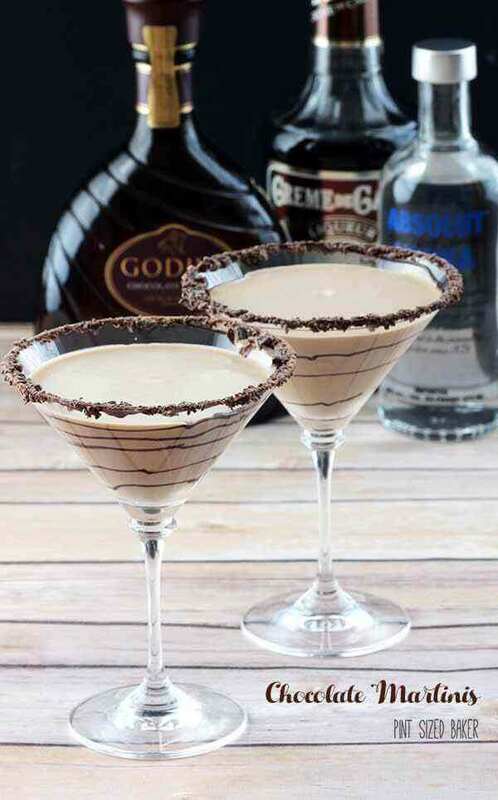 Find the recipe for the Chocolate Martinis HERE. Thank you. I wasn’t sure how to stretch this into three recipes, but I was so happy with the martini addition. Now I know why your blog is named that….I almost licked my screen! definitely going to have to try this recipe! Wow this is a work of art! so beautiful! What a GREAT little tart, Karyn! The chocolate mint combo is one of my favs. Thanks for sharing at Marvelous Mondays. Pinned! And, it was simply wonderful! G’day! Great photos and recipe! Chocolate and Mint are the BEST!! Thank you. I tasted amazing as well. Your recipes look awesomely decadent! I swoon for anything chocolate! p.s.- Love the name of your blog! Thanks so much 🙂 It took me a long time to come up with the perfect name!